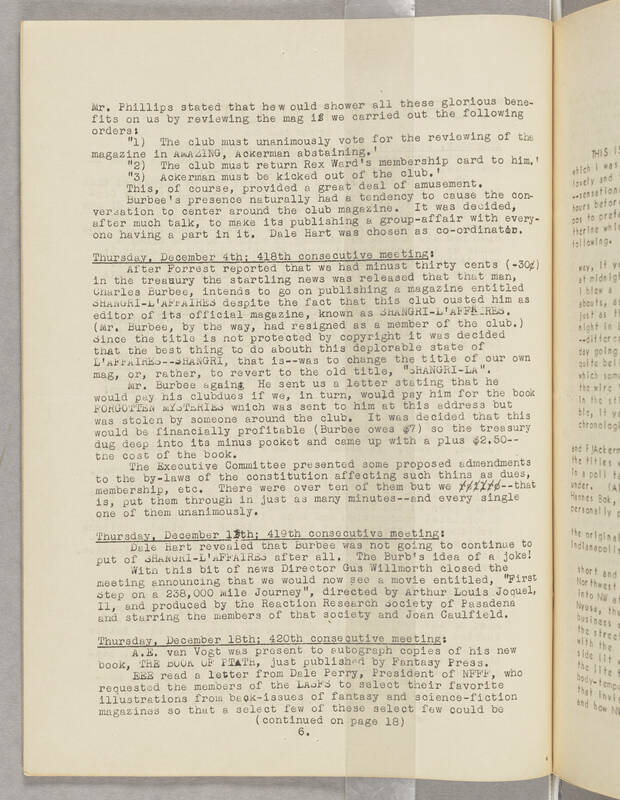 Mr. Phillips stated that he would shower all these glorious benefits on us by reviewing the mag if we carried out the following orders: "1) The club must unanimously vote for the reviewing of the magazine in AMAZING, Ackerman abstaining.' "2) The club must return Rex Ward's membership card to him.' "3) Ackerman must be kicked out of the club.' This, of course, provided a great deal of amusement. Burbee's presence naturally had a tendency to cause the conversation to center around the club magazine. It was decided, after much talk, to make its publishing a group-affair with everyone having a part in it. Dale Hart was chosen as co-ordinator. Thursday, December 4th, 418th conseutive meeting: After Forrest reported that we had minust thirty cents (-30¢) in the treasury the startling news was released that that man, Charles Burbee, intends to go on publishing a magazine entitled SHANGRI-L'AFFAIRES despite the fact that this club ousted him as editor of its official magazine, known as SHANGRI-L'AFFAIRES. (Mr. Burbee, by the way, had resigned as a member of the club.) Since the title is not protected by copyright it was decided that the best thing to do abouth this deplorable state of L'AFFAIRES--SHANGRI, that is--was to change the title of our own mag, or, rather to revert to the old title, "SHANGRI-LA". Mr. Burbee again: He sent us a letter stating that he would pay his clubdues if we, in turn, would pay him for the book FORGOTTEN MYSTERIES which was sent to him at this address but was stolen by someone around the club. It was decided that this would be financially profitable (Burbee owes $7) so the treasury dug deep into its minus pocket and came up with a plus $2.50--the cost of the book. The Executive Committee presented some proposed admendment to the by-laws of the constitution affecting such thins as dues, membership, etc. There were over ten of them but we railro--that is, put them through in just as many minutes--and every single one of them unanimously. Thursday, December 11th; 419th consecutive meeting: Dale Hart revealed that Burbee was not gong to continue to put of SHANGRI-L'AFFAIRES after all. The Burb's idea of a joke. With this bit of news Director Gus Willmorth closed the meeting announcing that we would now see a movie entitled "First Step on a 238,000 Mile Journey", directed by Arthur Louis Joquel, II, and produced by the Reaction Research Society of Pasadena and starring the members of that society and Joan Caulfield. Thursday, December 18th; 420th consecute meeting: A.E. Van Vogt was present to autograph copies of his new book, THE BOOK OF PTATH, just published by Fantasy Press. EEE read a letter from Dale Perry, President of NFFF, who requested the members of the LASFS to select their favorite illustrations from back-issues of fantasy and science-fiction magazines so that a select few of these select few could be (continued on page 18) 6.